This is not a beauty deal but I'm just too excited to share the news with you girls. Finally Giorgio Armani Beauty is back in Singapore. Exclusively available at DFS Galleria Beauty Hall, you can found full range of skincare and makeup lines! Will write a separate post on my loves but my favorite is their foundation, blush, and eyes to kill cream shadow! Kose's Japanese makeup expert, Dobashi-san, is in town! Enjoy makeup service at $60 (fully redeemable). 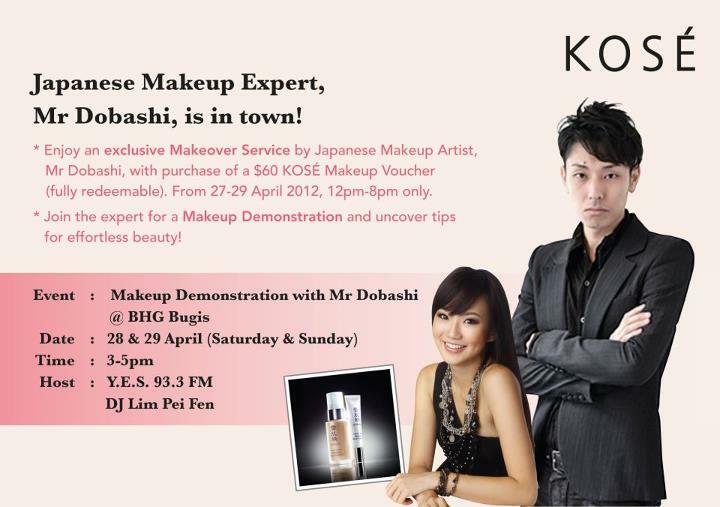 From 27-29 April 2012, 12pm-8pm only. Afterglow Cosmetics offers free shipping with any purchase. No code needed. Valid for Apr 24 only. Aveda offers free shipping and a deluxe sample of best selling Hand Relief with any $25 purchase. Enter code MOM42 at checkout. Valid thru April 25. Beautorium offers 20% off sitewide. No code needed. Valid thru May 2. Beauty.com offers free travel size Borghese Fango Active Mud Mask for Face & Body with any $10 purchase. No code needed. Must enter thru link. While supplies last. Beauty Collection offers free Caudalie Super Cru Cream worth $60 and free shipping with any $75 Caudalie purchase. Enter code supercru at checkout. Beauty Sak offers deluxe sample of Jonathan Product Dirt Texturizing Paste and free shipping with any $35 purchase. Enter code GWPJP at checkout. While supplies last. Bobbi Brown offers free Mini Lip Brush, Mini Crystal Lip Gloss and mini Lip Palette Set with any $100 purchase. Enter code MDAY412 at checkout. Valid thru Apr 27. Boscia offers a free Antioxidant Recovery Treatment C worth $48 with any $30 purchase. Enter code Treatment2012 at checkout. Valid thru Apr 30. Fresh offers a travel size Soy Face Cleanser with any $100 order. Enter code SOY at checkout. Valid thru Apr 26. MAC Cosmetics offers free shipping with any purchase. Enter code PLAY at checkout. Valid thru Apr 29. Neostrata offers a free Daytime Protection Cream SPF15 with any $100 purchase. No code needed. While supplies last. Perfume.com offers 10% off on all orders. Enter code MOM at checkout. Valid thru May 1. Philosophy offers 25% off sitewide. Enter code save25 at checkout. Valid thru Apr 25. QVC is having today's TSV of Nick Chavez Advanced Volume & RootLift Haircare Collection. Special price ends at Apr 24 11:59pm ET. Strawberry offers Mother's Day Specials of up to 65% off. Valid thru May 13. Yves Rocher offers a free Apricot Botanical Scrub with any purchase. No code needed. Valid thru Apr 26.